After completing his graduation in M.B.B.S, Dr. Balaji obtained M.S in General surgery from The Tamilnadu Dr. M.G.R. Medical University, Chennai in 2000. Then he underwent D.N.B in General surgery from Ministry of Health & Welfare, Government of India and F.R.C.S from the Royal college of Surgeons of Edinburgh. He completed his M.Ch in Surgical oncology in 2004. 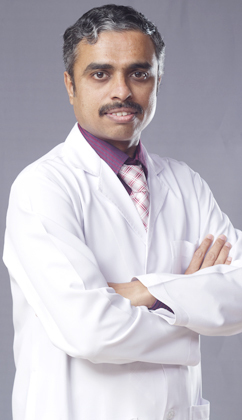 Dr. Balaji has been examiner for European board of Surgery – Surgical Oncology division since 2010. He was conferred honorary diploma in European Board of Surgery. Dr. Balaji has a brilliant post-graduation career, as he submitted numerous papers on Cancer surgery, has involved in laryngeal cancer research works and presented thesis on G.I injury. Beside this he had attended in several International conferences and workshops. Dr. Balaji has a rich experience of 15 years in Cancer surgeries, with his special area of interest being Thyroid, Gastrointestinal and Breast cancer surgeries. Presently, with the rich experience in thyroid surgery, the spectrum has expanded towards Endoscopic thyroidectomies. Tran’s axillary approach for thyroidectomy is no more a dream & has come to reality resulting in NO NECK SCAR after thyroid surgery. This procedure is highly unique, which very few doctor’s in Abu Dhabi could perform. Dr. Balaji can speak English, Hindi, Tamil and Malayalam.